We offer the ease and simplicity of uploading and creating your own art on a canvas gallery wrap. 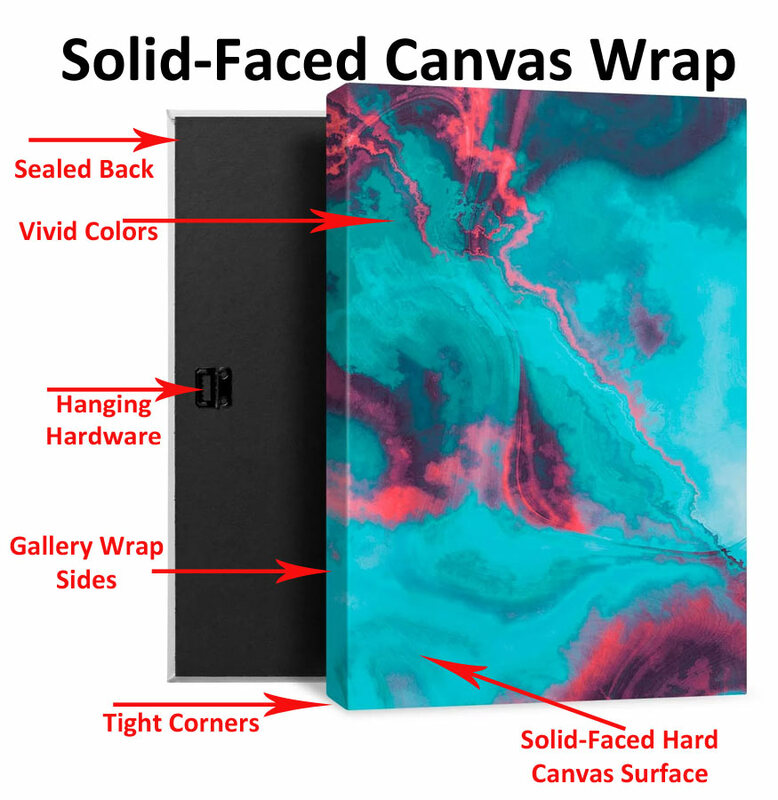 These high quality canvas wraps feature a solid-faced backing that makes them different from conventionally stretched canvas that has an open back. Our solid-faced canvas wraps come with a sealed back that keeps out dust and insects. They have tight corners and the canvas will not sag or buckle. Every canvas wrap comes with hardware, making it ready to hang. The printing method for our wraps consists of a premium artist-grade canvas and custom-developed pigments that incorporate UV protection. This special combination resists fading and scratches to provide you with a lifetime of enjoyment. First, you are assured the best quality for the price for digital images printed on canvas. The patented process behind our gallery wraps results in a product what won’t warp or sag with time. Our wraps are designed to stay taut and flat. They hold up through the reasonable pokes and prods of everyday life. You can literally push on the front of our solid-faced canvas print and it won’t warp or sag. Although they are designed to hold up to a reasonable amount of pressure, don't put all your weight on the front of a canvas. The reason our canvas wraps hold up so well is because they specially mounted on hard, high-density wood fiberboard. Furthermore, sizes 16x20 and larger come with protective polystyrene foam. This protects the canvas both inside and out. Adding to a crisp clean look are the tight corners on our canvas wraps. Not only do the front and sides have a crisp look, but back has a clean look as well. Unlike conventionally stretched canvas that is stapled and has an open back, ours is different. The backs on our canvas wraps are sealed using a patented process. This process assures each wrap has tight corners. It also guards against dust and insects getting behind the canvas – which a traditionally stretched canvas print permits! 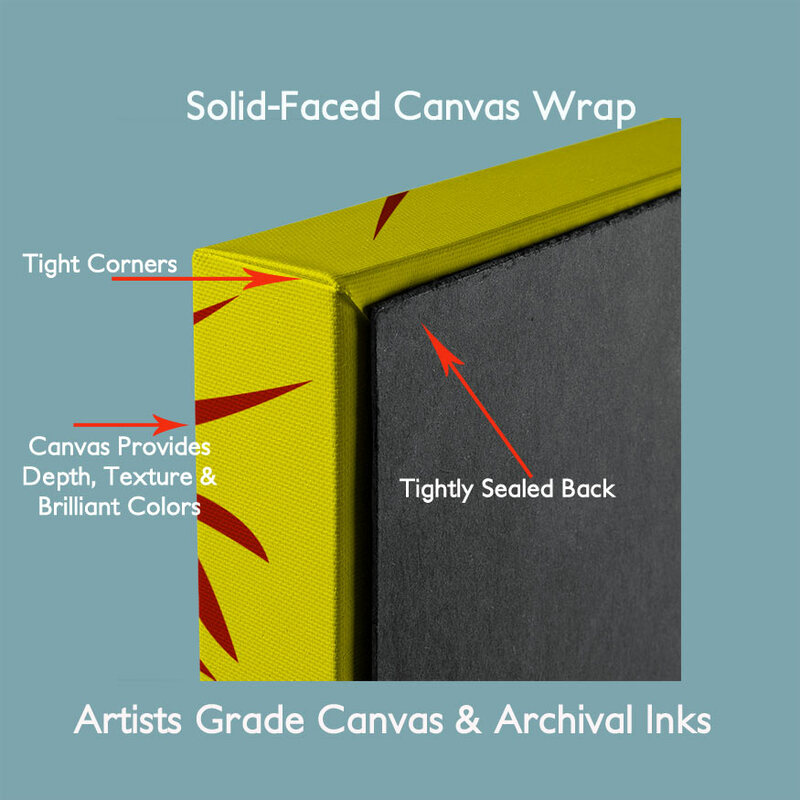 Our canvas wraps utilize the highest quality canvas and inks. The quality of the finished product is so high that it belongs in a museum! The reason is because all of our canvas is certified museum-grade and matched with archival inks designed to withstand the tests of time. Our wrapped canvas prints offer you the choice between four basic canvas gallery wrap selections. One wrap has white sides, the second choice is for black sides, the third choice is for mirror sides, and the final choice is for museum wrap. You can click on the link here to upload your image to create a canvas wrap. If you prefer a frame that complements the gallery wrap, we offer a wide latitude of framing options from float frames, to ornate frames, and even to rustic frames in our shop. We invite you to stop by our shop at 10070 Ford Avenue, Richmond Hill, GA to discuss framing options. If you need assistance uploading a fill, feel free to call us at 912-756-2781. All wraps are store pick-up with about 2 weeks processing time. We will contact you once the canvas wrap arrives.